This was the first rotation to acclimatise up Everest. We were on a schedule ahead of most others which would see us move all the way through the Icefall, up to Camp 1, spend two nights and then up to Camp 2 to spend two nights. The plan was to then come back down to Base Camp, rest for a good few days and then start our third rotation which would take us straight to Camp 2, then up to Camp 3 for a night before descending all the way back down to Base Camp. After that, we would make our summit attempt. We started out early yet again from Base Camp. We walked up to our Puja site and burnt juniper whilst our Sherpa (who some are also monks) prayed for safe passage. We then crunched through the darkness of Base Camp, past Crampon point and started up into the Icefall. The first half went relatively quickly and pain free which was because we had done this half before and there were no surprises or unknowns. After a quick break in the ‘Football field’ we continued up the Icefall. The remainder was similar however there were more ladders spanning crevasses and tied to the increasingly large walls of ice before us. Some ladders were tied side by side due to stability issues others were tied to end to end creating giant 6 ladder spans going directly up massive walls of ice. Paul crossing a ‘double ladder’ where it seems one ladder was not stable enough. These were particularly bouncy. As we climbed the last long span of ladders we seemed to be out of the ice fall and up onto the sloping and cracking glacier which fed it. This was the beginning of the Western CWM. After a few switch-backs we started to see our destination, Camp 1. The way out of the Icefall onto the Western CWM…. a final long six span ladder up a wall of ice. We arrived into Camp one just as the sun was warming us. This is a good thing as the sun up on the Western CWM (a large bowl of glacier going up from the Icefall all the way to the Lhotse face) can be scorching hot in the middle of the day. We unloaded our gear and moved into our tents. Home for the next two nights — boiling in the sun, freezing in the shade, bitter in the evenings. The day was hot and we were once again playing a game of escaping the sun by hiding in our tents and then escaping intense heat of our tents by going outside. We spent the night there and tried to enjoy our first military ration meal which was even more difficult to digest than most meals we had been eating up until this point. The next day we put on our climbing gear and headed up into the Western CWM before the sun hit for some acclimatisation training. The trail presented more crevasse spanning ladders and steep walls of ice to manoeuvre up before we got to the half way point between Camp 1 and Camp 2. We then turned around and camp back down to Camp 1 to spend the night. We were up early the next morning to pack our gear and make the move up to Camp 2. This day was a cloudy and cooler day which is exactly what you want when moving up the ever flattening Western CWM. The day started out easy moving over some relatively flat terrain negotiating the obstacles we had encountered the day before. As we moved up higher and higher we started to get a clear view of our next few challenges. The Lhotse face which leads up to the South Col and then up towards the summit of Everest herself. It seemed achievable and for the first time I felt confident that we could actually do this. The summit of Everest 2500m above us with the South Summit Pyramid to the right. The Western CWM ends in a narrow valley which is surrounded by the vertical 1500m faces of the three mountains which feed it, Nuptse, Lhotse and Everest. Camp 2 is perched in the corner under Everest with the two other faces only a few hundred metres away. The location seemed protected if you ignore the skyscraper sized seracs clinging to the surrounding walls above camp. Around 11am we arrived into IMG Camp 2 exhausted and gasping for air. We were at this new altitude for the first time on this trip (6500m) and were really feeling it. We ate some food and then went to our allocated tents to drop off and set up our gear. Camp Two. This is the next day when the sky was clear. When we first arrived visibility was down to a few metres due to low lying cloud. After getting the mattresses and sleeping bags out at 11:30am Paul and I laid down and tried to have a little rest. Around 12:00, just as I was about to drift to sleep I was awoken by the tent violently shaking. At first I thought it was simply strong winds but then I heard the deep groan of the Earth below us and not only the tent but WE were shaking from side to side also. Behind us began the sound of a booming avalanche which started coming down the massive vertical walls of Nuptse. At this point Paul and I were wide awake. I had never experienced an earthquake before and my first thought was there was a giant avalanche which had displaced part of the glacier we were on and this was the cause of the shaking. Normally when we hear avalanches (every day and night) I wait to see how long it continues for before acting. If it lasts more than about 5–10 seconds and gets louder, it might be time to think about running. We stuck our heads out the front of the vestibule to try and see what was happening but it was futile in the low foggy cloud but one thing was for sure, these avalanches were not stopping. We could make out chunks of ice falling right in front of us from the west shoulder of Everest. We looked up the camp and made eye contact with our guide who yelled “Time to put your boots on guys!” I’ve never put my 8000m boots on so fast and we were out of the tent in seconds. This is when the third wall surrounding the camp, the Lhotse face released which was much louder and lasted much longer than the others. Amongst the roaring snow and ice we could also hear rocks crashing down from the top of Everest. At this point most Sherpa and clients from surrounding camps started to run straight down the valley, some with boots, others bare foot. This didn’t seem like the best idea to us as all three avalanches would inevitably funnel into this thin valley. At this point is seemed to be just a matter of seconds before we would be hit. Visibility was only a few metres so we couldn’t be sure which one would hit us first. To be honest I wasn’t scared but at the same time I wasn’t feeling much at all. I was kind of numb knowing that there was nowhere to go and if we were going to be taken out, there was not a lot we could do about it so we just waited and tried to watch. Then came the powder blast. It blew through camp like a sudden blizzard blasting everything with fine ice particles. As we protected our faces we waited for the chunks of ice and rock to follow however they never came. The powder blast faded and the rumbling of the avalanches stopped. It was silent. People had stopped running down the valley. Now Sherpa started to stumble into camp, some wailing in pain injured from running into rocks and boulders during their escape. The three of us hybrid climbers at Camp 2 ran to each other embraced. We tried to figure out what the hell had just happened. We moved into the mess tent which quickly turned into a treatment room for the injured Sherpa. There were no serious injuries and they were dealt with quickly and efficiently. We decided that we should call home on the Satellite phones to let our families and loved ones know we were ok as we thought this could make the news. After our calls home we sat in the mess tent trying to process what had occurred. That is when the radios started up. Our guide radioed down from Camp 2 to let our Sirdar (expedition leader) know that we were OK. The same call came from a rattled but safe Camp 1 (who had a similar experience to us but were in the middle of a crevasse filled glacier with nowhere to run). The response from Base Camp was not so good. We sat there over the next few hours listening to the communications between climbing outfits at Base Camp. It was clear that something terrible had happened at Base Camp way below us. The IMG camp along with HIMEX and ASIAN TREKKING seemed to get off unscathed and turned into first responders. The IMG camp was instantly converted to the Base Camp hospital with all injured being moved over to our site with HIMEX taking all the ‘homeless’ Base Camp victims. The speed and organisation from IMG was amazing. I am certain that many lives were saved thanks to their quick actions. It seems the default radio frequency to tune into was IMGs standard frequency. The same happened in 2014 during the Icefall disaster. The three of us hybrid members spent that evening wondering what was going to happen next. We didn’t know what state Kathmandu, Nepal or the region was in. We did not know if the expedition was over or if it would continue. In hindsight it should have been obvious but we were unaware of the scale of the damage. There were aftershocks. Some were long, others were quick. That night I went to sleep up at Camp 2 not knowing if we would even wake up. The next morning three guides from different outfits in Camp 1 went into the Icefall to see what state the route was in. This is when the large aftershock hit. Once again there was a loud deep groan from within the earth. The ground started to shake from side to side. We all jumped up, ran out of the mess tent and started to watch more avalanches kick off around us. Luckily this aftershock was only about 10 seconds and the avalanches were short and weak compared to the day before. The guides and Sherpa in the Icefall were luckily not injured and although they lost their route in due to fallen ice, managed to make it out using their expert ice climbing and mountaineering skills. That day, to our surprise the helicopters which were collecting Camp 1 climbers started to thump higher up the CWM towards us at Camp 2. 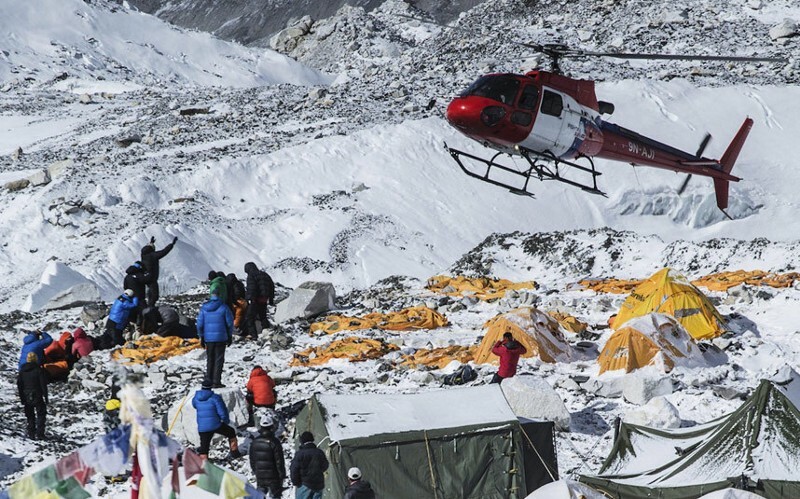 Whole climbing teams were being evacuated one passenger at a time (due to the thin air vs weight of the helicopter). We watched multiple choppers come up for collections and by the end of the day half the outfits at Camp 2 were gone. We spent one more restless night at Camp 2 before waking early, breaking down Camp (on the assumption we would return back up in a week once the Earth had settled) and moved down to Camp 1 where all clients from remaining expeditions were queued up waiting for helicopters to pluck them from the glacier and take them down to Base Camp. After a long wait my personal Sherpa and I were up. We jumped into the chopper which was poised for take-off and were surprised to see the inside of the helicopter was stripped bare. There were no seats other than the pilot’s. This was to save weight and make it easier to get up into the thin air. We sat on the metal floor of the helicopter holding on where we could. We lifted off and dropped down low straight over the Icefall towards Base Camp. The ride for Pasang Sonar Sherpa and myself. To my surprise we flew straight over a decimated Base Camp and landed in the IMG camp right next to my still standing tent. The remainder of the tents had all been flattened and the area used as an evacuation pad for the injured and deceased. We spent two more days in Base Camp before hearing that all teams were pulling out of Everest this year and that the season was over. As more news trickled in from the rest of the country (and the world), it seemed like absolutely the right decision. Before we left Base Camp, we spent one afternoon wandering through the blast site to get an idea of what took place here. It was a sobering and grim experience. Personal items and blood spattered rocks were strewn across the valley and the camps we had previously seen, were now absolutely annihilated. It looked like artillery had rained down from above. As we negotiated our way through the wreckage we would come across sleeping bag wrapped bodies stacked up ready to be removed by the waiting helicopters. Amongst all of this, dazed and confused climbers were wandering around picking through the rubble trying to locate their missing items. During this walk I found one of my two friends I knew here on other expeditions, he assured me that he and my other friend survived this terrible incident without injury. I was more than relived. Here are some images from the worst of Base Camp. No captions necessary. This entry was posted in Everest 8848m (2015) and tagged Alpine, Alpinism, Alpinist, Base Camp, Climbing, Earthquake, Equipment, Everest, Everest Base Camp, Expedition, Kathmandu, Lobuche, Mountaineering, Mountains, Nepal.